Rameswaram (Chennai to Rameswaram 572 km) is a small island in the Gulf of Mannar, is a major pilgrim centre. It is connected to the mainland by road and railway bridges. Rameswaram is a holy place because Sri Rama, on his return from Sri Lanka, offered his thanks to Lord Shiva and performed pooja to wash away his sin in killing the Demon King, Ravana. 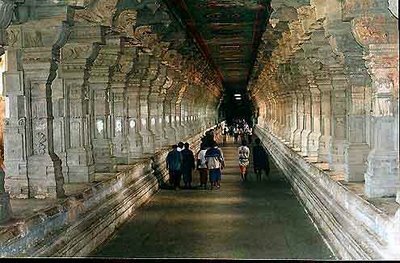 Rameswaram is known for its 22 theerthas or wells in and around the main temple. This place is equally sacred to both Vaishnavites and Shaivites. According to Hindu Mythology, if one visits Rameswaram and prays to Lord Shiva one will be relieved of one’s sins. It is 197 metres long. Besides pilgrimage, Rameswaram Island has several places, which are ideal picnic spots. There are beautiful beaches at Olaikuda, Dhanushkodi and Pamban. The Olaikuda beach is 1 km from the main temple and s engulfed by coral reefs, which makes bathing in the sea safe and enjoyable. With diving glasses and respiration tubes, scuba diving is safe and possible. Flamingos, sea gulls and a variety of birds migrate to the Rameswaram Island during winter. 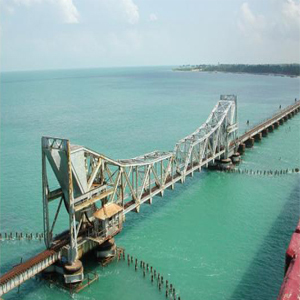 Rameswaram is a main fishing centre of Tamil Nadu. Variety of fishes including export quality fish like prawns, sea cucumber, and lobster are available here. Rameswaram is also famous for its dry fish.